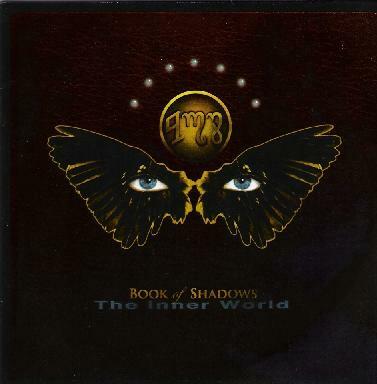 Book of Shadows - "The Inner World"
Hot on the heels of their last album - "…and then we all woke up" (see AI #36) - Book of Shadows are back with a new set of their experimental space ambient excursions. "Evolution" opens the album with dual guitar interplay, spacey drones and Sharon Crutcher's vocal embellishments. "The Dreamer and the Dreamed" is an ethereal, yet noisy affair, that includes a contrasting blend of edgy guitars, electronics and Sharon's whispery vocals. "Music for Cocoon Bearing Insects and Animals Part 1" is nicely freaky with a potpourri of electronics, howls and assorted bleeping spacecraft sounds. Wow, this is like being lost in some alien forest, and being surrounded by a symphony of creatures and voices. But then things get more overtly spacey and it feels like an astronaut separated from his ship, floating through space and bombarded by a banquet of sounds. A very cool spaced out sound piece that would make a fantastic sci fi soundtrack. "Ring Chaos" features the more experimental side of the band, with a combination of folk-psychy guitar, noise-drone guitar and wind swept keyboards. But there's lots going on, with atmospheric and melodic elements working in harmony with the noise and clatter. We're also treated to a trippy Indian styled psychedelic segment. Another very cool spacey sound journey. Finally, "Energy Follows Thought" is like a meditative classical avant-garde symphony in space… how's that for a description! Book of Shadows really excel at bringing together disparate components of instrumentation and voice to create always interesting sound works. I felt they really hit their stride with their last album, and The Inner World demonstrates that they continue to evolve and mature. Available to purchase for download from http://www.artificialmusicmachine.com.